Annual; culms 20–100 cm. high. Leaf-blades linear-lanceolate to linear, 8–30 cm. long, 5–7 mm. wide, straight at the base, pilose or hispid, acuminate. Panicle oblong or ovate, 15–40 cm. long, much branched, the branches long, fine and spreading at maturity, the spikelets borne in pairs at their tips. Spikelets ovate, 2.5–3 mm. long, glabrous, acuminate; lower glume broadly ovate, 1/2–2/3 the length of the spikelet, 3–5-nerved, acute to acuminate, separated by a very short internode from the rest of the spikelet; upper glume broadly ovate, 5–7-nerved, acute; lower lemma broadly ovate, 7–9-nerved, sterile, its palea 1/2 as long; upper lemma pale and glossy. Annual with slender erect culms 20–100 cm. high. Leaf laminae 8–30 cm. long, linear, pilose or hispid, tapering to the apex. 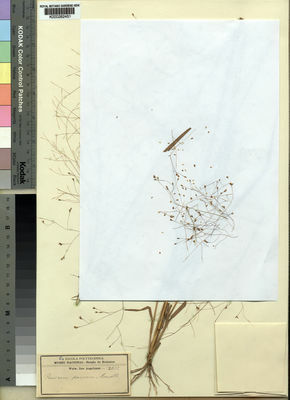 Panicle 15–40 cm. long, oblong or ovate, much branched, the branches long, fine, flexuous and spreading at maturity, the spikelets borne in pairs at their apex. Spikelets 2.5–3 mm. long, ovate, glabrous, acuminate; inferior glume broadly ovate, 1/2–2/3 as long as the spikelet, 3–5-nerved, acute to acuminate; superior glume broadly ovate, 5–7-nerved, acute; inferior lemma 7–9-nerved, sterile, its palea poorly developed; superior lemma and palea pale and glossy. A weed of waste places. Annual. Culms 20-100 cm long. Ligule a ciliate membrane. Leaf-blades linear, or lanceolate; parallel-sided; 8-30 cm long; 5-7 mm wide. Leaf-blade surface hispid, or pilose. Leaf-blade apex acuminate. Inflorescence a panicle. Panicle open; oblong, or ovate; 15-40 cm long. Primary panicle branches spreading. Panicle branches capillary. Spikelets in pairs. Fertile spikelets pedicelled; 2 in the cluster. Spikelets comprising 1 basal sterile florets; 1 fertile florets; without rhachilla extension. Spikelets ovate; dorsally compressed; acuminate; 2.5-3 mm long; falling entire. Rhachilla internodes elongated between glumes. Glumes similar; reaching apex of florets; thinner than fertile lemma. Lower glume ovate; 0.5-0.66 length of spikelet; membranous; without keels; 3-5 -veined. Lower glume apex acute, or acuminate. Upper glume ovate; 1 length of spikelet; membranous; without keels; 5-7 -veined. Upper glume apex acute. Basal sterile florets barren; with palea. Lemma of lower sterile floret similar to upper glume; ovate; 1 length of spikelet; membranous; 7-9 -veined; acute. Palea of lower sterile floret 0.5 length of lemma. Fertile lemma oblong; dorsally compressed; 2-2.5 mm long; indurate; pallid; shiny; without keel. Lemma margins involute. Lemma apex obtuse. Palea involute; indurate. Aké Assi, Contrib. 2: 286. Robyns, Fl. Agrost. Congo Belge 2: 200 (1934). Stapf in Flora of Tropical Africa 9: 700 (1920). Rendle, Cat. Afr. Pl. Welw. 2: 177 (1899).